By Leah Dobrinska. Nov 2, 2016. 9:00 AM. 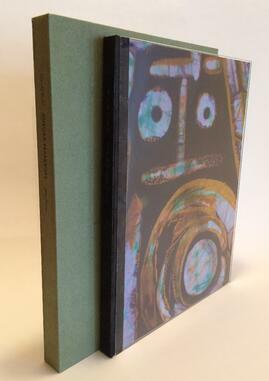 Heavenly Monkey is set to release its latest fine press publication: Aurora Teardrops. The book—a collection of poems by legendary musician Harold Budd and batik paintings by artist Jane Maru—has been in production for over two years, but the collaboration between author and illustrator is something that’s existed for longer still. Indeed, the entirety of Aurora Teardrops proves to be the perfect melding of different parts—each shining bright on its own but glowing when combined. Rollin Milroy and Heavenly Monkey worked closely with Harold and Jane to hone the overall concept and ensure the final product was the right combination of materials, methods, and presentation. Both Harold and Jane were kind enough to sit down and answer some questions about Aurora Teardrops, their work as individuals, and their collaborative efforts. We hope you enjoy this extra insight into a truly phenomenal work. As a limited edition, we’d encourage you to reserve your copy today. Books Tell You Why: How did you meet? Jane Maru: We met in the Mojave Desert where I was in artist's residency. He came out one afternoon to check out my paintings, and it was here that he first encountered my batiks. 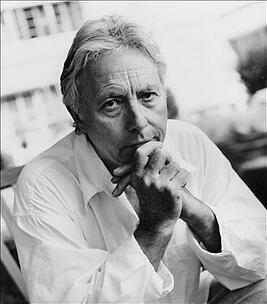 Harold Budd: I had discovered something I had never seen before – I was lucky. Books Tell You Why: What led to this Aurora Teardrops collaboration? Jane: Our work is complementary. When I read Harold's poems or hear his music, I see a particular color palette full of light and shadow. Really, it's that simple. Harold: I periodically labored on it as it occurred over 18 months and simply stopped when it seemed to be a piece, and that was a hunch. Books Tell You Why: What should folks who’ve acquired either the deluxe or collector’s edition of Aurora Teardrops pay special attention to? Jane: Rollin and I spent almost a year experimenting with different options for incorpating my batik artwork into the book, and until we settled on the right option he couldn’t really finalize the overall design and concept. What we ultimately settled on was reproducing a number of pieces as high-resolution giclée prints on traditional blueprint vellum. It’s a semi-transparent sheet, so it creates a similar effect to my original silks. It’s a special sort of paper, nearly a fabric. To really emphasize the transparency, we printed each image reversed on the back of the sheet, so the colors are incredibly intense. 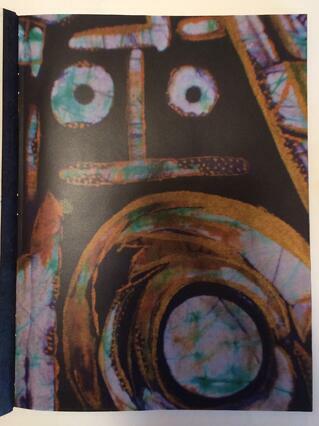 It was brilliant of Rollin to print images of my batik onto it because it allows light to pass through the page, just like the backlit paintings I create. It creates a similar effect to the batiks hanging in the desert which Harold first saw, right down to how the paper moves with a life of its own, like silk in the breeze. I did 34 original watercolors inspired by Hal's poems, one for each copy of the deluxe edition. These took several months to complete. Books Tell You Why: What’s your favorite part of Aurora Teardrops? Jane: Collaborating with others to make something extraordinary. Harold: No favorites, really. I suppose my favorites are tramps: footloose, open, irresponsible occasionally and sometimes haunted: like the one in Maida Vale, London, on a frosty night -- still with me, always will be. Books Tell You Why: What can you tell us about the live musical performances of the Aurora Teardrops poems? Jane: This time last year we tested the waters in front of a small audience in Joshua Tree, California to see how it felt. Then we went to The Kitchen in New York City, which is a 'black box' theater. While I recited the poems, the audience became part of the darkness of the space, melding with the soundscape that was Harold and his partner, Bradford Ellis. We performed in South Pasadena for an intimate gathering, and we got together to full circle back in Joshua Tree for the last performance of Aurora Teardrops at the end October. Books Tell You Why: What are the similarities and differences when collaborating on a book versus on a musical performance? Harold: So different that to say anything begs the possibility, the presence of similarities, and there aren't any. Books Tell You Why: You wrote a brief introduction for each other in Aurora Teardrops. How did you describe each other? Jane: My introduction describing Harold is an homage to someone whom I consider a true friend. 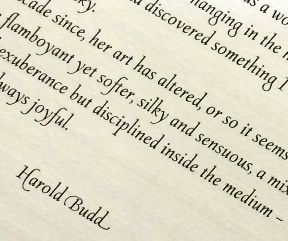 Harold: Her art is always, always joyful. Books Tell You Why: Anything else you’d like for readers to know about Aurora Teardrops, you, or your work? Jane: Harold and I collaborated on a CD/DVD compilation called, “Jane 1-11" that's worth searching for. He composed 11 pieces that I did films for. Really, it's a precursor to Aurora Teardrops. Books Tell You Why: When did you first begin writing poetry, and what are your biggest inspirations for writing? Harold: I began writing in the mid-80s. There were things I didn't want to slip away from me, and only me. It came together in 1990 as we recorded By The Dawn's Early Light at Daniel Lanois' studio in New Orleans. After five weeks, Bill Nelson and I recorded alone for the remaining five days; my son, Terrence, in Los Angeles, faxed my artless scribbles to me. I had to record me reciting them—there was no one else. My inspiration for Aurora Teardrops: distant echoes. Books Tell You Why: Where does your poetry diverge from your music, and where does it overlap? Harold: I can't compare the two—they're not the same thing. They're simply, to my mind, not the same—two totally separate things. They come together because they spring from the same source: same past, same memories, but not the same. Books Tell You Why: Just out of curiosity, do you have any favorite poets or artists? Harold: My favorite poets are Dante Gabriel Rossetti and Christina Rossetti, and Michael McClure. My favorite painters are Cy Twombly, Billy Al Bengston, Serge Poliakoff, Sandro Chia, and Agnes Martin. Jane Maru is an artist in the truest sense of the word, and her art isn't limited to one medium. In Aurora Teardrops, we get to view her batiks—the results of silk, cotton, hot beeswax and dye, taking on a life of their own, layer by layer. For those who are not familiar with Jane and her work, be sure to check out Jane 1-11 as well as Aurora Teardrops. Jane was kind enough to answer some questions about batik art in general and her process. Hearing about Jane's work in her own words only gives us a greater appreciation for the beauty to be found in Aurora Teardrops. Enjoy. Books Tell You Why: Can you tell us a little bit about yourself and your work up to this point? Jane: My work continues to be an evolving mixture of film, video, painting, batik, assemblage, installation and in the last few years, collaboration. 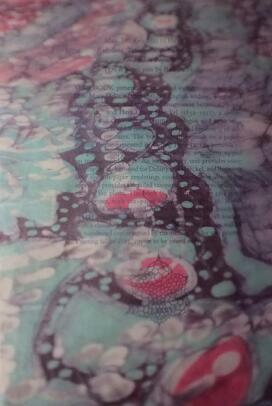 Books Tell You Why: For those not familiar with batik, please give a brief explanation of the art. Jane: Batik is an ancient art form which utilizes beeswax and dye mediums to create paintings on natural cloth. Books Tell You Why: Tell us a little bit about your process. How do you begin? How long does it take you to complete work for a project like this? Jane: There are two distinct parts of the process. The first is the technical, which is preparation of the fabrics, mixing of dyes, getting the beeswax up to perfect temperature. After these tasks, I have a practice of simple rituals to clear my mind, allowing for concepts and ideas to free-flow. I do this before I begin each painting. These impressions are the foundation of a piece, from there it takes a life of it's own through the batik process of layering beeswax and dye. As I mentioned, for Aurora Teardrops, I did over 30 original watercolors inspired by Hal's poems, one for each deluxe edition. These took several months to complete. Many thanks to Harold Budd and Jane Maru for their time and insight into this remarkable work. Thanks, as well, to Rollin Milroy for his assistance in coordinating this interview. 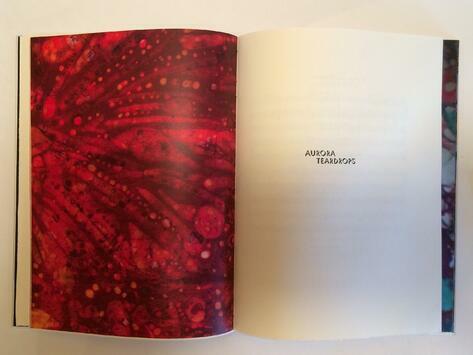 We hope you're inspired to acquire your own copy of Aurora Teardrops. You won't be disappointed!